M.D. Roofing, founded in 1975 by Mark Drinkwater, is a local company operating out of the West Island of Montreal. With its team of veteran roofers, M.D. Roofing prides itself on giving its customers a professional and top quality roof installation, all with an excellent warranty and a customer service you can count on. M.D. 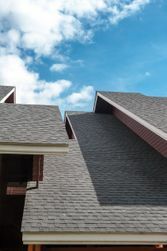 Roofing has accumulated thousands of satisfied customers over the years. Remember, it's your roof and our reputation. Request a quote today. You won't be disappointed!